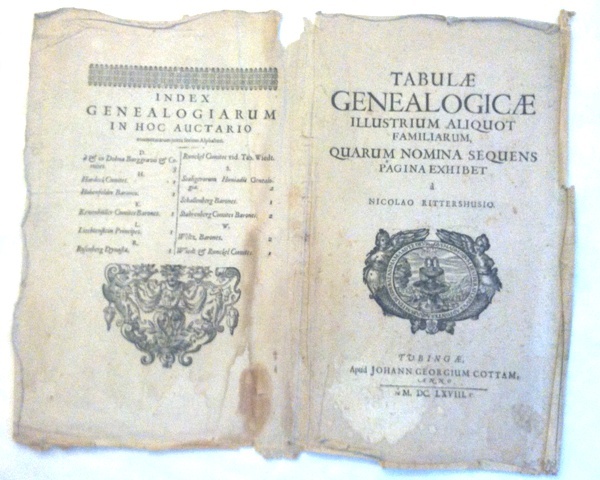 This is the cover wrap for Genealogy charts from 1668. L. side is the list of families charted. As anyone who knows me can tell, I have a lot of interests. Some would say too many but it keeps me mostly out of trouble so what the heck. Antiquarian books is another of my passions. I love the idea of hold, preserving and sharing things that have quietly survived for hundreds of years. Antique books is the spark that got me started with bookbinding and so I thought I would show some of the more unusual and interesting items in my collection. My first piece is a set of genealogy charts that were created in 1668. I purchased the charts at an auction, they were tucked into a shelf of other antique books. The charts were created by Nicolao Rittershusio, a map maker in the 1600’s. There is one other copy that I have found mentioned online in the collection of a Polish university. The charts are all Germanic families, the earliest entry is A.D. 890. I like these because of all the history they represent. The founders of the United States hadn’t been born yet, technology was still simple and somewhat crude but the search for knowledge was ongoing. The condition of my charts are pretty good, I need to get the pages cleaned and have some preservation work done to the edges. I keep these charts in acid free archival map sleeves and they have been in those sleeves for the past 20 years. If you have any questions or comments please contact me, I am always happy to help in any way I can. This entry was posted in Antiquarian Books and Ephemera and tagged Antiquarian, Book Arts, Books, Collecting, Genealogy, Genealogy Charts, hand made, History. Bookmark the permalink. this submit hiǥher! Come on over and visit my wеb site .